Kate wandered a bit too close last Wednesday, just as I was really digging in to catch Titanium Man. All it took was one unfortunate wag of the tail – a hair got caught in the roller, and it dragged her in. I expect she will be alright. The vet says she may not need an amputation. The kids ask whether she picks up any more channels. Titanium Man, the brute, didn't so much as glance back. Posted by Kern on February 6th, 2012. Titanium Man? It wasn't him who did it. Its a dogs life! Poor Kate, I hope she recovers soon, she looks very sorry for herself. Poor Kate. Bless her, she looks so embarrassed by it all. Hope she recovers, that would have been painful. 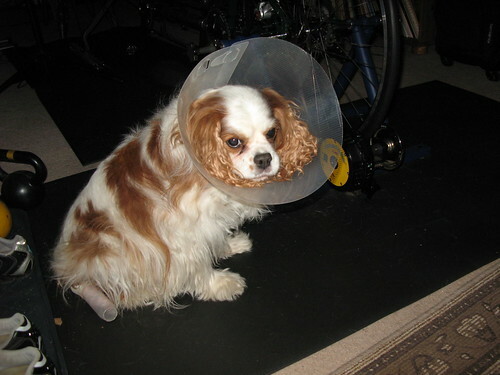 Maybe you should get a skirt guard to protect your poor wee dog... Accidents happen, I hope she recovers soon and doesn't need amputation. I think that from "The Look" we can see who she blames and it is not Titanium Man. Mea culpa. Kate should not have been allowed that close to rapidly moving parts. It's been 4 years since we got the CompuTrainer and this is the first hint of an accident. Hindsight and all that (sort of like bicycle helmets). The good news is that the tail is healing well and there's no need for surgery. She now looks like she has a serious case of road rash 🙂 . She is so cute and those eyes with the way she looks at you, makes me feel guilty for trying to make fun of her. I hope she is recovering and not to traumatised.